If you tend to be larger than you’re supposed to be, finding foods that satisfy you and keep you on the right side of the scales is a challenge. You could go for all the sugar-free (chemical laden) foods that line the supermarket shelves or simply eat raw (as I tried for a month – it certainly worked for a while). No matter what ‘diet’ or eating regime you follow, you are likely to feel hungry, because we ‘fatties’ are used to eating more than is necessary. I’ve got to the point, though, of deciding hungry is not a nice state to be in. Therefore I have to find foods that nourish and satisfy my taste buds at the same time. For instance, those rice ‘biscuits’ that look like bits of polystyrene stuck together just do not do it for me. I am also trying to avoid foods with large numbers of chemicals disguised as harmless numbers – which accounts for about 99% of products on supermarket shelves. I mean you have to understand that some of those innocuous numbers are there for a good reason. We don’t want to be eating stale-tasting food, or food that has gone ‘off’, so a little preservative is good for us if we shop in a supermarket. If we browse in our garden we can be sure (as long as we wash the produce before we eat it) by and large we’re not going to get sick eating fresh and we’re not going to be swallow a bunch of numbers. However, for most people that is not possible, or possible only during the growing season. Supermarket food is our only alternative. I’ve also worked out that wheat products (basically bread) play havoc with my digestion so I am avoiding gluten. The path I’ve chosen is expensive! So what are my choices? Grow my own and eat copious salads, or educate myself into reading labels and uncovering some gems. That’s what I did this afternoon. 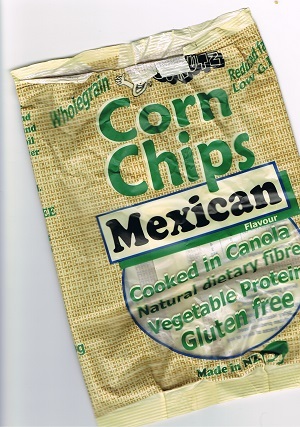 I ate some Gluten-free Corn Chips made by a NZ company called GoNutz. This company packages nuts and snack foods for retail outlets, and while I’m well aware how snack foods are adding to our waist-lines, I was at first pleasantly surprised when I read the list of ingredients in these Wholegrain Corn Chips. Reduced fat and Low G.I. (better for diabetics), and there were only three sets of numbers! Calcium 529 = Prepared from chalk as an acidity regulator. I’m fine with that. Oh dear. We have all heard how accumulation of heavy metals in the body can have life-threatening effects. It’s not as if there aren’t alternatives. A safer alternative cold be Furcellaria 408, A natural polysaccharide, produced from seaweed in Denmark. It is used as a thickening agent, stabiliser and emulsifier especially in products for diabetics. Acceptable daily Intake: Up to 75 mg/kg body weight so you could eat a lot and still not have any poor effects. Canola Oil (which contained an antioxidant 319 = Tertiary-butylhydroquinone (TBHQ). So I looked that up and found out that TBHQ is used in many foods, ranging from crackers to crisps to fast foods. TBHQ is in fact a chemical preservative which is a form of butane. It is used in foodstuffs to delay them going rancid and greatly extends their storage life on supermarket shelves. Oh dear. Oh dear. I did some more research and found out that Olive oil is a better healthy choice than Canola Oil, though more expensive. It is claimed that Olive oil can even help prevent or reverse type 2 diabetes, since it helps your body produce adiponectin, a hormone that helps regulate blood sugar levels. As Go Nutz corn chips claim to be Low G.I. the implication is that the food is better for diabetics. The product is already a higher priced option, and if like me you’re looking for safe, tasty fill-me-up foods, you are prepared for that extra cost. I guess I will have to leave my corn munchies to corn on the cob out of my own garden. For now at least – unless Go Nutz go Olive oil and seaweed and make a great product even greater. Recently I have been noticing how much packaging we throw away. Although we do recycle paper packaging through our furnace / free-standing wood burner, we still have to throw away a lot of plastic packaging. Now I know that we could be shopping in the bulk-buy shops or aisles of our supermarket, but when you need to exclude food additives, you really need the packets for the fine print. And for many people with allergies and specific preferences (just try being a vegetarian or vegan) you need to know what sneaky little chemicals or food additives are present in your supermarket purchases. Governments are insisting that information such as Best Before dates and ingredients listed in their relative amounts are clearly stated on labels. Manufacturers can’t even hide behind a label like ‘tomato sauce’ without revealing what went into making that tomato sauce. Great for the discerning shopper, but inevitably foods are being packaged more and more into plastic or tinfoil. Then I started thinking about other ways our life choices are being packaged for us. Take Amazon, for instance. Great store and I buy from it often using Amazon recommendations. These recommendations have nothing to do with what is quality writing but are based on topics we have already purchased and what other purchasers, who also purchased the same recent book, then chose to purchase. As we purchase Amazon’s recommended books we add to the likelihood that those books will also be recommended to others who will do the same as us. Note that the recommendations are based on purchases, NOT on reviews of quality. The most popular books become those that have the best marketers behind them – the ones whose digital ‘dust covers’ sell the book in the most compelling way. Although Amazon does allow readers to write a review of books they purchase, a book could ostensibly become popular without a single review, especially Kindle books that don’t have hard copies in conventional shops. Come to think of it, traditional books ride on marketing too. I remember receiving books and videos to review when I working as a journalist. We reviewed them, however, prior to being released on the unsuspecting public. Amazon’s system is ‘packaging’ of a different kind without the detail required of food packaging – no health warnings required. You just get to read what everyone else is reading and you’re unlikely to ever come across well-written books that are not so vigorously marketed and are therefore less likely to come before a mass Kindle market. A Kindle book is cheap. If you don’t like it, the book sits on your Kindle device or on your Kindle Cloud until you decide to delete it. And you (well … I) don’t feel as bad as I would if I was throwing away a hard copy. Independent (Indie) authors are forced to become marketers and learn how to package our own books. We cannot leave ‘our publishers’ to handle all the ‘packaging’ and get on with the next book. So book plug, dear readers: Take a look at my own offering: Real Estate Rollercoaster in which I trace our ups and downs in the real estate world and share what we learned (often the hard way) about buying, building and selling real estate. I also talk about the emotions that may beset a first time buyer or investor, and that could get in the way of making could real estate decisions.